Lower utility costs and better noise control are just a few of the benefits of enhancing your property with additional home insulation in Winter Haven, FL. Since all of these benefits come from having good insulation, we feel justified saying that home insulation really is one of the best things you can do for your wallet and your home. The best part is that when you invest in insulation, the savings are almost immediate. We have been meeting the needs of homeowners who want to enhance their home with proper insulation for over twenty years. We realize that when it comes to home insulation, everyone has different preferences and ideas about what will work best. For this reason, we are proud to work with several different types of insulation, including batting and blow-in insulation. If you are unfamiliar with batting insulation, this type of home insulation is one of the most common types found in homes throughout Winter Haven, Florida today. Made out of fiberglass or rock wool, this insulation comes in long rolls that can easily be cut to fit into oddly shaped areas. 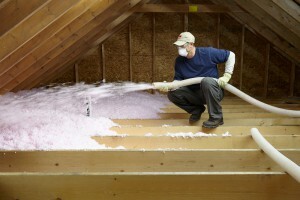 Comparatively, blow-in insulation is designed to be sprayed into wall cavities and other tight spaces. Made up of loose particles, one of the benefits of this type of home insulation is that it does not leave gaps or air holes. In the home insulation industry, one common term we use on a frequent basis is “R-value.” This term refers to how heat flows through the thickness of a material and is one of the most important things to consider when you are enhancing your home with new insulation. Basically, the main thing you need to remember is that the higher the insulation’s R-value is, the better it will insulate your home. While you might think that the best way to go is to pick the home insulation with the highest R-value, this is not always beneficial because other factors need to be considered. For example, you need to consider the humidity in your area, temperature changes, and how windy your area gets. We would be more than happy to go over different R-values with you and determine which type of insulation will best meet your needs and your budget. If you are ready to enjoy the many benefits that come from enhancing your home with additional insulation, our team at Polk County Insulation is ready and waiting to help. As home insulation professionals, we’ve set a high standard for customer service in our industry and are confident you will benefit from our commitment to customer satisfaction. To find out more about our services or to get the home insulation process started, please don’t hesitate to give us a call today! We look forward to hearing from you and to going above and beyond your expectations.